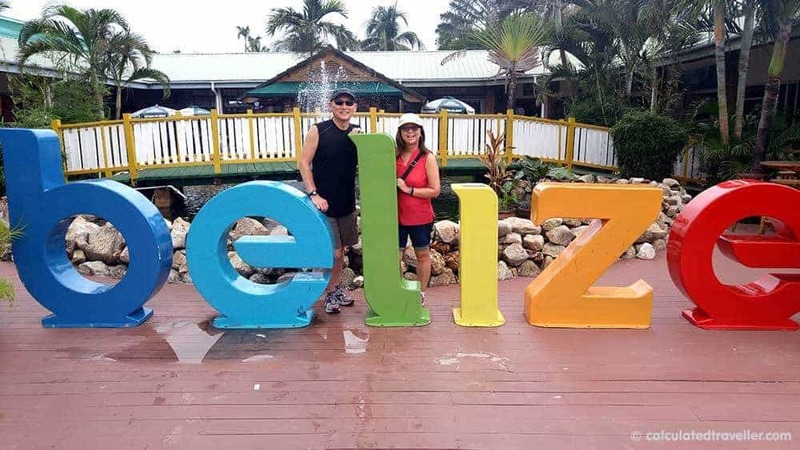 Cruise ship port terminals are often just pit stops for you to catch your excursion bus or taxi to tour you around the island, but sometimes in a case like Belize City Belize, the Cruise Port is the destination! Since the city of Belize has a very shallow port area, cruise ships aren’t physically able to dock next to the pier. 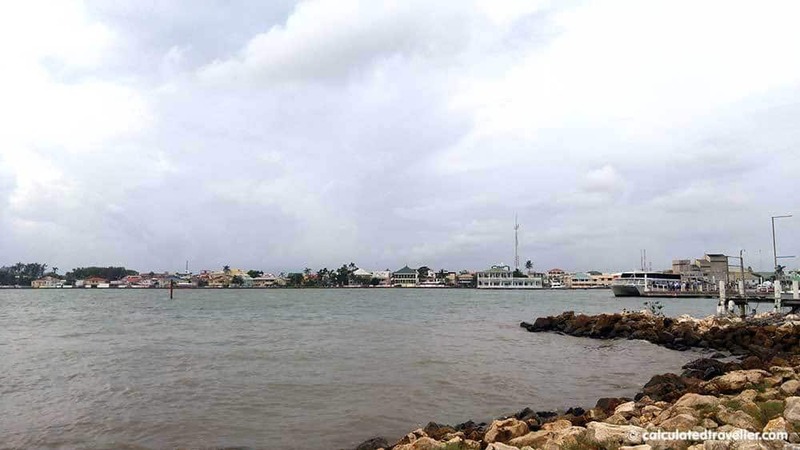 As a result, ships must lay anchor a few miles out in the middle of the ocean where the water is deeper and rely upon local Belize Port Authority ferries to transport (a.k.a. tender) passengers off of the ship and onto the island. I find the entire tender process to be a pain since the ferries carry so few people compared to the number of passengers that wish to go ashore. The actual ride is only about 20 minutes but, the waiting, lines ups, and time spent seems to take forever! Note: There aren’t any beaches near the Belize City cruise port. 1. Book a tour from the cruise lines shore excursions desk where you will receive priority disembarkation ahead of the regular passengers without tour tickets. Excursion are easy but can be expensive. 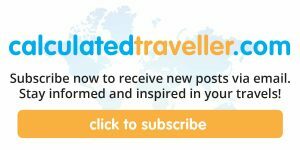 Options include tours of the Mayan ruins, cave tubing and water sports adventures and most include time for Belize cruise port shopping. Once you are happily standing firmly on the island, explore the shops, restaurants, and bars at the Belize cruise port Fort Street Tourism Village. 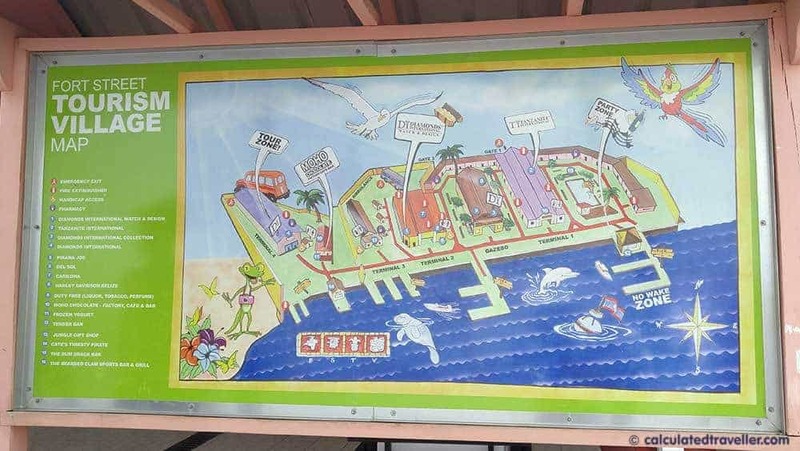 Here is a photo of the Belize Cruise Port Map sign and pictures of Belize cruise port. 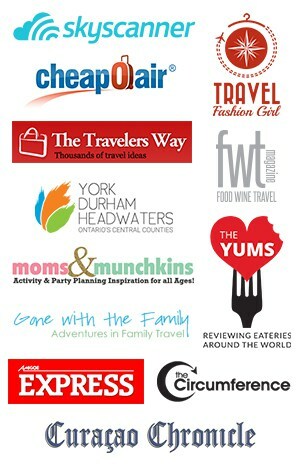 Have a few photo moments — perfect for social media, your annual newsletter and scrapbook! There is a Belize sign inside the village. 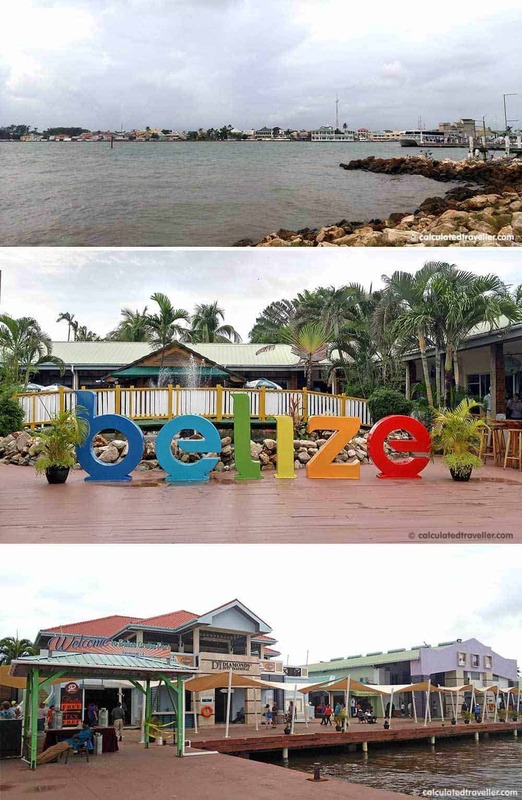 There is also a Belize sign outside of the tourism village next to the Baron Bliss Lighthouse. You can spot it as you are riding the tender ashore. To get to the lighthouse, walk outside the village gates and turn right along the road to get to the memorial. There is one more Belize sign on the island, but I’ve yet to discover it! While you are out by the lighthouse, you might as well walk through town to get some local flavour. Just be aware that Belize is one of the poorer Caribbean islands. The city isn’t as commercially developed as cities such as Nassau or Grand Cayman. We’ve never had any safety issues but, we stick to the Fort Street main drag and don’t venture too far away from the terminal. TIP: Watch your step as you walk through town. The roads and sidewalk are not maintained, and a lot of spots need repair. Be careful also when crossing the street, as cars do not yield to pedestrians. If you did manage to leave the cruise ship early, you could also check out some other nearby islands such as Caye Caulker by taking one of the local island water taxis. 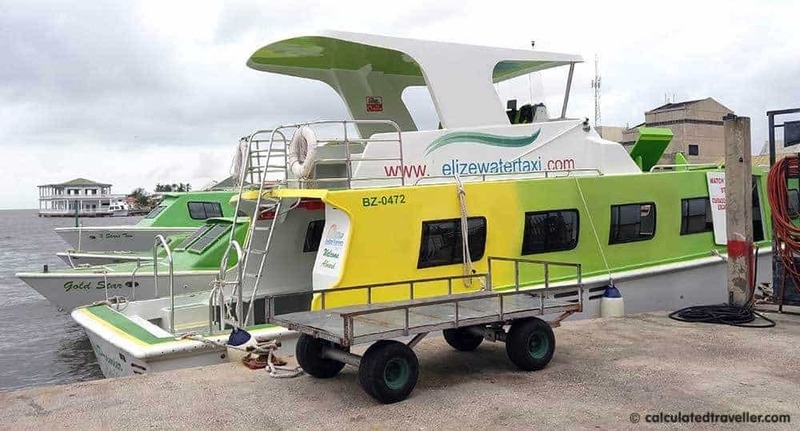 The ferry terminal is on Fort Street in the opposite direction of the lighthouse and here you can hop on the Belize Express. 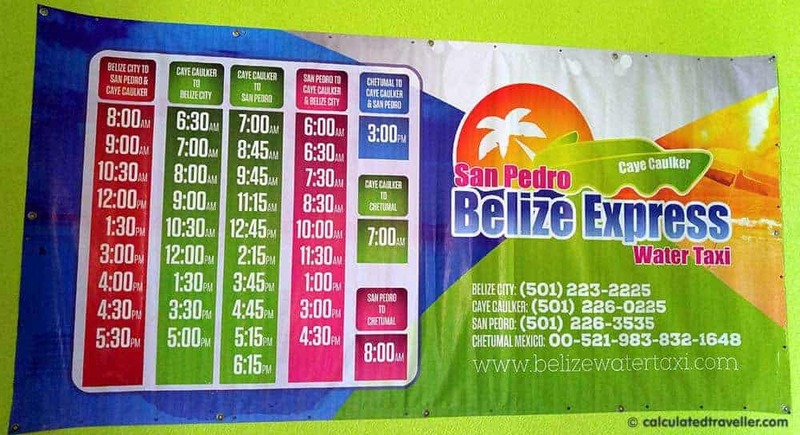 Here is a photo of the Belize Express timetable — read it carefully, confirm the schedule when you buy your ticket, and remember that the cruise ship will not wait for you should the water taxi be late. So, keep an eye on your watch. Have you visited the Port of Belize before? What would you do if you only have one day on this pretty island?